The $3.8 million helicopter is lowered onto rollers just outside the TSTC Aviation Maintenance Technology building yesterday for easier movement into the hangar. HARLINGEN — Lead instructor Tom Cross and Interim Provost Rick Herrera stood patiently in the warm mid-morning sun and gusty wind at the Aviation Maintenance Technology hangar yesterday. There, they watched each step of the arrival of one of the best gifts Texas State Technical College in Harlingen has received — a premiere Bell Helicopter valued around $4 million. As preparations were made for a crane to hoist the machine off the flatbed and carefully place it on the ground for tie down, Cross talked about the impact this will make for his students and the aviation maintenance program. There are “nuances” that go into flying these machines and mechanics need to know each of those, Cross said. But, probably the most important specifications of the helicopter are the two turbine engines that power the flying machine. That allows his students to work in many fields, not necessarily in aviation. He said his students are recruited for jobs in wind turbines, diesel and automotive, among others. Students also will learn about the balancing of the blades and rigging the helicopter properly. “A mechanic needs to know how it works in the air,” Cross said. For those students pursuing aviation mechanics, there are jobs out there. Cross said there are 50 in the program at TSTC in Harlingen. Cross said the responsibility of working on an airplane or helicopter is immense — it is life and death. “There are a total of nine federal tests you have to take before obtaining your license,” he said about being an aviation mechanic. He hopes this helicopter will help motivate the students. He said this new helicopter will be used to teach students at TSTC for at least 15 to 20 years. Cross, who was a student at TSTC himself in 1999, before joining on as a staff member in 2001, said he didn’t expect the helicopter would be in such good shape. It’s a far cry from the old helicopter previously being used. “This sure is a nice Christmas gift for us,” he said, while staring at the multimillion dollar, almost new helicopter. The students are on break right now, so they won’t see it until they return. Cross knows they will be thrilled and surprised, just as he was. • Fort Worth-based Bell Helicopters selected TSTC’s program for this major donation of two of their premier helicopters over every other college and university. Harlingen received one of the helicopters yesterday. • The Bell 427 donated to the Harlingen Aviation Maintenance program is unit #4 off the assembly line. • The helicopter’s value is $3.8 million. This one was used as a systems engineering, flight test helicopter for advanced systems and design. It has a total flight time of 738 hours, so essentially, it’s almost like new. 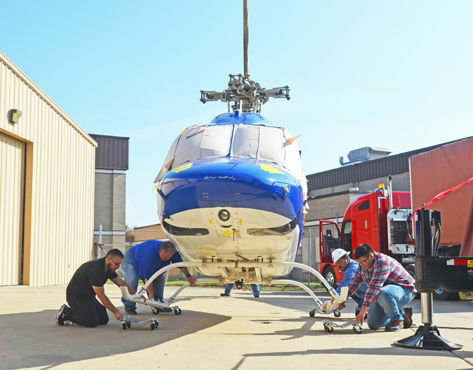 • This Bell 427 is no longer made, but the systems and equipment on the machine will be an effective, live systems trainer for the program at TSTC. It will also further assist in the students obtaining knowledge and experience. What still has to happen? It may be awhile before the TSTC students can get their hands really dirty inside the Bell 427. The helicopter is in a state known as pickling. TSTC Aviation Maintenance Technology program instructor Tom Cross said the fluids have been drained and preservatives have been put in their place all as part of an extended storage and shipment procedure. “We will have to remove all those agents and get it back functioning,” he said. The helicopter’s rotor blades are now in wooden boxes and will have to be put on. “We will have to get it all back up in and running,” Cross said. That will be a learning process, too.